Apr. 4: Meeting 7:30 p.m.
Apr. 20: Monte Carlo Whist Card Party 7:00 p.m.
May 2: Meeting 7:30 pm. Our March 7th meeting was really a COLD night out. But we had 9 brave souls that ventured out. We want to send a GET WELL MESSAGE to our Assistant Steward, Ann Posuniak, as she is down with Vertigo. We wish her a speedy “Get Well” message. We also learned last evening that 2 other members are on the “Get Well” list. Sister Zell Ferrando is coming home in a day or two from hospital. She has a broken leg and Brother Henry Killam is going into the hospital for surgery on his neck. We wish them all a Speedy Recovery. 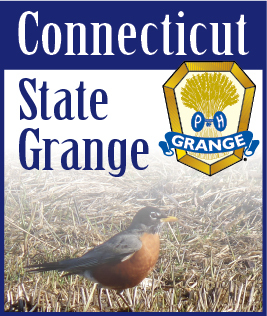 At the meeting it was also announced that we are now on the Grange web site. Brother Dan Posuniak said he will try to keep it updated. They also decided to hold our April Card Party. It is scheduled for April 20th and that is Easter Eve, but all felt that will not be an issue. A reminder is going out to all members that May 1st is our BAKELESS/ FOODLESS SALE. We hold two a year and this is the first one for 2019. May 2nd is our meeting at 7:30 p.m. and the Lecturers program is “May Flowers”. It is also the Memorial Service put on by the Chaplain and the 3 Graces. May 18th Monte Carlo Whist Card Party and refreshments and door prizes always welcome. Plan on attending and enjoy a fun night out.